Founded in 1922, Bothwell Castle Golf Club enlisted a Glasgow architect by the name of Mr. Adams to lay out the club’s original 18-hole course within the Bothwell Estate, to the east of the 13th century castle ruins, and this new layout was officially opened the following year by the Earl of Home, father of Prime Minister Sir Alec Douglas Home. In the late 1960s, the club lost seven of the holes on the course (from the old 9th to the 15th) to a private housing development and another architect, a Mr. F T Lyon, was commissioned to set out the replacement holes. After much deliberation over a variety of different issues, the remodeled course came into play in 1973. Bothwell Castle’s clubhouse was lost to a fire in 2002 and it was rebuilt and relocated to a more central position, resulting in a resequencing of the holes. In 2014, a number of substantial course improvements were carried out on the back nine, involving the installation of new bunkers and open drainage ditches. Today, the course measures 6,224 yards from the back markers, with par set at 70. It’s laid out on relatively level terrain, with tree-lined fairways providing a quality parkland game of golf for members and visitors alike. The signature hole is regarded as the 159-yard 8th, where an intimidating little burn runs across the front of a sand-protected green. I have played at Bothwell Castle many times over the years and was lucky enough to be here on a gorgeous summer day earlier this week. 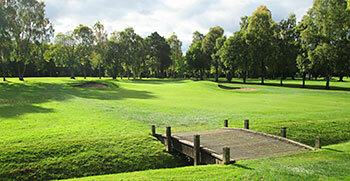 If the phrase 'mutton dressed as lamb' can be applied to golf courses I believe Bothwell is a prime example. The clubhouse is impressive, excellent practice facilities and the course was in prime condition with quite superb greens. In short the club does all it can to present itself to the world. The drawback is the layout, or, to be more precise the terrain which is unremittingly flat. I know the same is true of the magnificent Woodhall Spa but... With the relatively new configuration of holes Bothwell begins with a series of long par fours which are all three-shotters for a mid-handicapper. There is some relief at the 5th and 6th before the short 8th offers up the first (and best) par 3 on the course. The back nine is quite a bit shorter and marginally more interesting. 10 and 12 are enhanced by burns across the fairway (both fairly new) but 15 is one of the blandest par 3s imaginable. the dogleg 16th provides a challenging drive through a narrow chute of trees but this hole is let down by poor - even unfair - hidden greenside bunkers. All things come to those who wait and by far the best hole at Bothwell is the par 5 18th where the downhill approach to a small green is over a ditch with several punitive bunkers to be avoided. The club is one of the few in Lanarkshire with a waiting list. I suggest this is not on account of the course itself but its other amenities and location in an affluent area. Bothwell Castle was the last remaining course on the current Lanarkshire Top 10 that I hadn’t played so I was glad to get the chance to remedy that situation this afternoon. Starting and ending with the only two par fives on the layout, the course is set with holes 1-8 on one side of the clubhouse and 9-18 on the other side. Five of the opening seven fairways run parallel to one another, which isn’t the most original of routings, but there’s a fair degree of separation between each hole so it doesn’t feel that cramped or constricted. The short par four 6th was easily my favourite hole on the entire course, primarily because it displays a little movement in an otherwise flat landscape. The tee shot plays blind and downhill to a ditch-fronted green that tilts from back to front and it’s rather an eye-catching hole (which I hope the picture on the right conveys). The first par three is encountered at the 8th, which for me is way too late in a round to be playing the first short hole on the card. It’s also by far the best of the four par three holes as the other three on the back nine are rather bland in comparison. The inward half is also nearly 500 yards shorter than the front nine - only one par four, the 90 degree doglegged 16th, measures in excess of 400 yards - and this disparity in length only highlights and reinforces the imbalance of the two nines. With a very impressive modern clubhouse, I can see why local golfers would want to be a member here, even if it might get a little damp in places during the winter. Although the course is a good, solid layout, it doesn’t quite match the excellence of the off-course facilities.